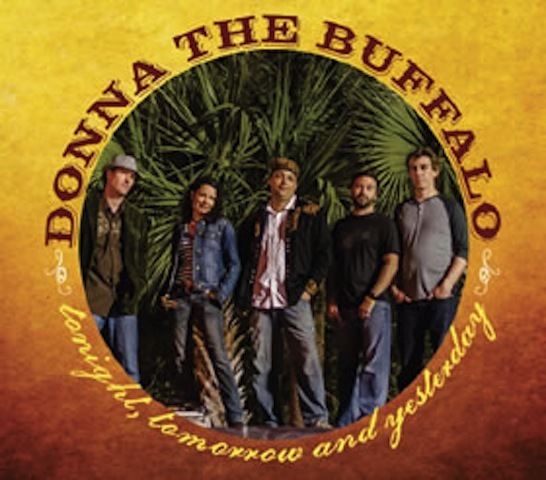 Donna the Buffalo are set to unveil their first studio album in five years called Tonight, Tomorrow and Yesterday, on 18th June 2103. The follow up to 2008’s acclaimed Silverlined, which reached the Top 10 on the Americana charts, Tonight, Tomorrow and Yesterday is the group’s 10th studio album. This album highlights their consistent stewardship of Americana music with their signature sound of an eclectic and extraordinary melting pot of traditional mountain music infused with elements of Cajun, rock, folk, reggae and country. In creating the new album, founding members and songwriter-vocalists Jeb Puryear (vocals, guitar) and Tara Nevins (vocals, guitar, fiddle, accordion, scrubboard)—joined by band members David McCracken (Hammond organ, clavinet), Kyle Spark (bass) and Mark Raudabaugh (drums)—convened in a rustic church in Enfield, New York, along with co-producer Robert Hunter. The building overflowed with vibe, and the music poured out as the group recorded take after live take to old-school analog tape, with as few overdubs as possible. What resulted are the 14 organic and authentic tracks that make up Tonight, Tomorrow and Yesterday. We tried to do the record and keep in tact the things people love about us – Jeb Puryear. We’re really excited to start sharing “Tonight, Tomorrow and Yesterday,” adds Nevins, “because making this record was a very personal process that was also a lot of fun – Tara Nevins. The album will be worked at Americana and AAA radio this spring and summer, with the emphasis track being “I See How You Are,” a tune penned by Nevins. In addition, the band will be touring heavily throughout the remainder of the year to promote Tonight, Tomorrow and Yesterday. The most up-to-date touring information can be found here. Closing in on the quarter-century mark, Donna the Buffalo has developed one of most respected ‘brands’ in the world of touring roots acts, along with a well-deserved reputation for crafting social narratives and danceable grooves without equal. With nine studio albums under their belt, the band has been praised as having “earned a reputation as one of the most respected, eclectic and hardest-working acts today” (Encore). Led by founding members and songwriter-vocalists Jeb Puryear and Tara Nevins, Donna the Buffalo marries musical trailblazing and tradition, their music running the gamut of what is defined as “roots music.” Throughout it’s career the band has traveled millions of miles and spent nearly a quarter of a century performing at the country’s most prestigious festivals and clubs. Their fervent fan base, nicknamed The Herd, follows the band with zeal and has created a unique and supportive community online and at DTB shows across the nation. As an extension of this community and the band’s own dedication to live roots music, Donna the Buffalo started its own annual event—The Finger Lakes GrassRoots Festival of Music and Dance—20 years ago in upstate New York, which draws more than 15,000 people every year, and have since added to the GrassRoots festival family with Shakori Hills in NC and the Virginia Key GrassRoots Festival in Florida. On June 18, 2013, the band will release its 10th studio album, Tonight, Tomorrow and Yesterday, via Sugar Hill Records.